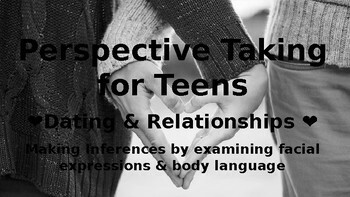 This PPT includes 46 Slides that target social inferencing related to forming relationships and dating. This is not solely a "Dating" lesson, and the photos can be used for simple inferencing and perspective taking lessons, but all photos are related to relationships between couples (with a few photos related to "jealousy" from a 3rd party). This lesson would be beneficial for students that have difficulty picking up on basic social cues (body language, facial expressions, etc. ), or tend to misread these cues. Each photo is followed by question prompts in order to generate discussion (e.g. "what is she thinking," "How can you tell," "Does she want to continue the conversation," etc.). The PPT is fully editable, so you can add or edit, as needed for your students. I hope you find this lesson helpful!